Using a new computer model, astronomers have determined that the black hole in the center of the M87 galaxy is at least twice as big as previously thought. Weighing in at 6.4 billion times the Sun’s mass, it is the most massive black hole yet measured, and this new model suggest that the accepted black hole masses in other large nearby galaxies may be off by similar amounts. This has consequences for theories of how galaxies form and grow, and might even solve a long-standing astronomical paradox. Astronomers Karl Gebhardt from the University of Texas at Austin and Jens Thomas from the Max Planck Institute for Extraterrestrial Physics detailed their findings Monday at the American Astronomical Society conference in Pasadena, California. To try to understand how galaxies form and grow, astronomers start with basic information about the galaxies today, such as what they are made of, how big they are and how much they weigh. Astronomers measure this last category, galaxy mass, by clocking the speed of stars orbiting within the galaxy. The Lonestar result was a mass for M87’s black hole several times what previous models have found. “We did not expect it at all,” Gebhardt said. He and Jens simply wanted to test their model on “the most important galaxy out there,” he said. Extremely massive and conveniently nearby (in astronomical terms), M87 was one of the first galaxies suggested to harbor a central black hole nearly three decades ago. It also has an active jet shooting light out the galaxy’s core as matter swirls closer to the black hole, allowing astronomers to study the process by which black holes attract matter. All of these factors make M87 the “the anchor for supermassive black hole studies,” Gebhardt said. These new results for M87, together with hints from other recent studies and his own recent telescope observations (publications in preparation), lead him to suspect that all black hole masses for the most massive galaxies are underestimated. 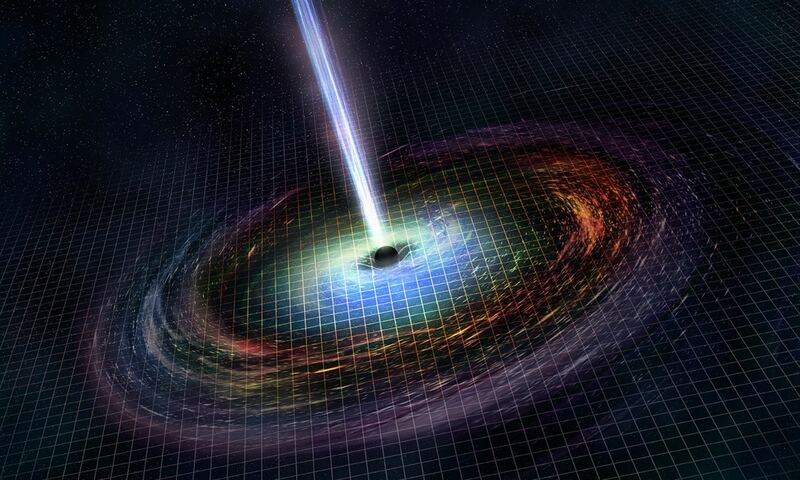 That conclusion “is important for how black holes relate to galaxies,” Thomas said. “If you change the mass of the black hole, you change how the black hole relates to the galaxy.” There is a tight relation between the galaxy and its black hole which had allowed researchers to probe the physics of how galaxies grow over cosmic time. Increasing the black hole masses in the most massive galaxies will cause this relation to be re-evaluated. Higher masses for black holes in nearby galaxies also could solve a paradox concerning the masses of quasars — active black holes at the centers of extremely distant galaxies, seen at a much earlier cosmic epoch. Quasars shine brightly as the material spiraling in, giving off copious radiation before crossing the event horizon (the region beyond which nothing — not even light — can escape). Today’s conclusions are model-based, but Gebhardt also has made new telescope observations of M87 and other galaxies using new powerful instruments on the Gemini North Telescope and the European Southern Observatory’s Very Large Telescope. He said these data, which will be submitted for publication soon, support the current model-based conclusions about black hole mass. For future telescope observations of galactic dark haloes, Gebhardt notes that a relatively new instrument at The University of Texas at Austin’s McDonald Observatory is perfect. “If you need to study the halo to get the black hole mass, there’s no better instrument than VIRUS-P,” he said. The instrument is a spectrograph. It separates the light from astronomical objects into its component wavelengths, creating a signature that can be read to find out an object’s distance, speed, motion, temperature, and more. VIRUS-P is good for halo studies because it can take spectra over a very large area of sky, allowing astronomers to reach the very low light levels at large distances from the galaxy center where the dark halo is dominant. It is a prototype, built to test technology going into the larger VIRUS spectrograph for the forthcoming Hobby-Eberly Telescope Dark Energy Experiment (HETDEX). I think what this article is saying is that we have not changed our estimate for the total mass of M87, but rather we now think that a higher proportion of that mass is in the central black hole, so a lower proportion than we previously thought is in the galaxy’s stars, gas and dust etc. Did I read that right? If so, I guess the dark matter problem still stands, because we’re still looking for missing mass? Bit confused, so any explanations gratefully received! I second that because I actually understood the contrary : less dark matter. AFAIU the article, it says that the mass of M87 hasn’t changed, indeed. So the SMBH is a little more massive and the halo is a little less massive. The mass of the SMBH is still only a small fraction of the mass of the entire galaxy. The SMBH in M87 has about 6.4*10^9 solar masses. According to Wiki the whole galaxy has a mass of about 2.4*10^12 solar masses. So the SMBH has less than 1% of the total mass. So the fractions don’t change much. This change is not such a big deal, I guess. The important point is that one can solve the problem that Quasars seem to have more massive SMBHs than we see in the local universe. If the SMBHs close by are more massive, this problem could be solved. Excellent description of the situation in relative terms, Dr. Flimmer. 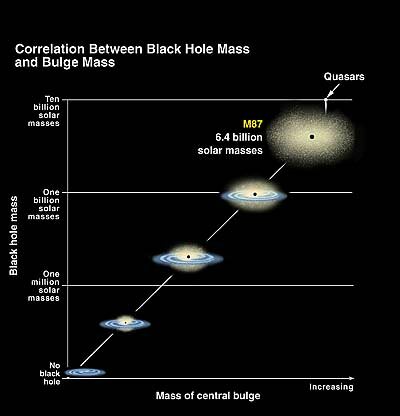 We see a range of masses of SMBHs in galaxies ranging from our Milky Way galaxy’s relatively small 4 million mass BH to M 87s 6.4 billion solar mass BH to certain quasars 40 BILLION solar mass BHs ( see paper on new 4×10^10 solar mass SMBH in the blazar S5 0014+813 here: http://arxiv.org/PS_cache/arxiv/pdf/0906/0906.0575v1.pdf ) . This paper also mentions other suspected ultra-high mass SMBHs and possible self-limiting conditions that may put the brakes on the ultimate mass attainable by SMBHs. So it seems that SMBHs come in a variety of sizes, dependent on initial conditions and subsequent merging events. And I again reiterate that Sgr A* is NOT considered to be an AGN. It may be an AGN in a dormant phase or a past or future AGN, but if it was a fully active AGN, you would see two Suns in our skies! Thank god that Sgr A* is not an AGN. I wonder if we would be around otherwise…..
I’m still trying to imagine a 40 billion solar mass black hole. In the paper they estimate the total mass of the galaxy at between 100 and 500 TRILLION solar masses! It will be interesting to see just where the mass limit lies for both SMBHs and galaxies.